In ancient Egypt, so many people worshiped Anubis, the jackal-headed god of death, that the catacombs next to his sacred temple once held nearly 8 million mummified puppies and grown dogs, a new study finds. The catacomb ceiling also contains the fossil of an ancient sea monster, a marine vertebrate that's more than 48 million years old, but it's unclear whether the Egyptians noticed the existence of the fossil when they built the tomb for the canine mummies, the researchers said. Ancient Egyptians built the temple and catacomb in honor of Anubis in Saqqara, a burial ground in the country's ancient capital of Memphis. Archaeologists have also found catacombs with the mummified remains of such other animals as the ibis (long-legged birds), hawk, baboon and bull, suggesting the ancient Egyptians also worshipped other animal gods. "When you go to Saqqara now, you see an area of attractive desert with the pyramids sticking up and one or two of the prominent monuments" associated with animal cults, said the study's lead researcher, Paul Nicholson, a professor of archaeology at Cardiff University in the United Kingdom. But during the Late Period (747 to 332 B.C. ), if one were to visit Saqqara, they would have seen temples, merchants selling statues of bronze deities, priests conducting ceremonies, people offering to interpret dreams and tour guides jostling for business, Nicholson said. Not far off, animal breeders likely raised dogs and other creatures that would later be mummified in honor of the gods. "It would have been a busy place," Nicholson told Live Science. "A permanent community of people living there supported by the animal cults." People have known about Egypt's penchant for mummifying animals for more than a thousand years. In about A.D. 130, the Roman poet Juvenal wrote, "Who has not heard, Volusius, of the monstrous deities those crazy Egyptians worship? One lot adores crocodiles, another worships the snake-gorged ibis ... you'll find whole cities devoted to cats, or to river-fish or dogs." In 1897, French archaeologist Jacques de Morgan published a paper on the necropolis at Memphis, but spent little time detailing the canine catacombs. 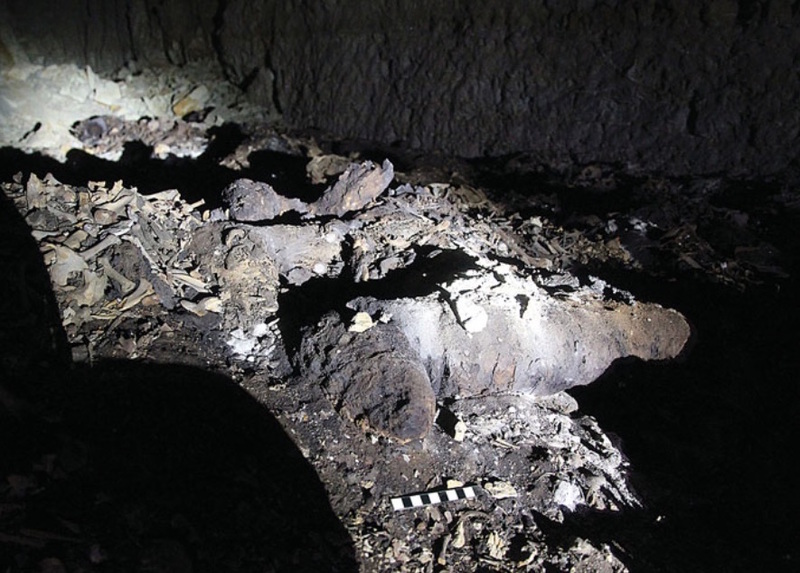 Other researchers have taken cursory looks at the dog catacombs, but the new study is the first to analyze it in depth, the researchers said. In fact, de Morgan drew a map showing two dog catacombs, but drifting sand and an earthquake in 1992 have made the smaller of the two inaccessible. So Nicholson and his colleagues spent countless hours examining the larger catacomb, studying its rock walls and mummified contents. "It's a very long series of dark tunnels," Nicholson said. "There is no natural light once you've gone into the forepart of the catacomb, and beyond that everything has to be lit with flashlights. It's really quite a spectacular thing." "The ancient [Egyptian] quarry men may have been aware of it, or they may have gone straight through it, it's hard to know," said Nicholson, who is still researching the fossil with several of his colleagues. The researchers explored every possible nook of the catacomb, which measures 568 feet (173 meters) down the center passageway, with a maximum width of 459 feet (140 m) from the branch corridors. In addition to canine mummies, they found the mummies of jackals, foxes, falcons, cats and mongoose, although about 92 percent of the remains belonged to dogs, they found. It's unclear why these other animals were buried in the dog catacomb, "but it is likely that all 'doglike' creatures were interchangeable, and that mythological reasons probably underlie the choice of cats and raptors," the researchers wrote in the study, published in the June issue of the journal Antiquity. Pilgrims visiting Saqqara likely viewed the display of the mummies as expressions of gratitude that the gods would appreciate, Nicholson said. Many of the dogs were only hours or days old when they were mummified. Some older dogs had more elaborate burials, and may have lived at the temple, but the younger pups were likely "bred -- farmed if you will -- for the cult," Nicholson said. It's likely that these young pups were separated from their mothers and died from dehydration or starvation. "They probably weren't killed by physical action; we don't have evidence of broken necks that you get with cat burials," Nicholson said. Animal cults remained popular from about 747 B.C. to 30 B.C., but they declined during the Roman occupation. The cults likely gained support because they were uniquely Egyptian, and may have been a symbol of national identity when the country was invaded by the people of other nations, such as the Libyans and Persians, the researchers wrote in the study. "They set up a pilgrimage temple for almost any deity you can fancy," said Aidan Dodson, a senior research fellow in archaeology at the University of Bristol in the United Kingdom, who wasn't involved with the study. He agreed that the temples and catacombs likely spurred trade and commerce. "There's probably a vast amount of trade coming in, not only for producing the animal mummies, but people wanting food, lodging and drinks," Dodson said. "It's probably an ancestor of a mass tourism industry."